chemical and biological interactions. Factors ... sence and amount of organic and inorganic ligands, ..... Advanced Inorganic Chemistry, 6th ed., Wiley, New York,. 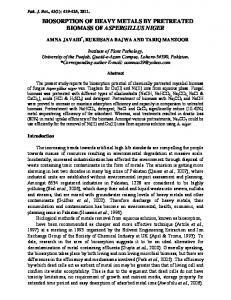 Dec 19, 2012 - The complexation of humic acid with certain heavy metal ions (Co(II), Ni(II), Cu(II), Zn(II) ..... removal, as a metal detoxification agent for industrial. Aug 17, 2013 - medicinal plants for heavy metals concentration is of great importance for physicians, health planners, health care professionals,. Corresponding author. Tel. : +34 91 394 43 35; fax: +34 91 394 43 57. E-mail address: [email protected] (F. Gonza´lez). contain several functional groups (amino, carboxyl, sulphate, hydroxyl, . . .) which could play an important role in the biosorption process. 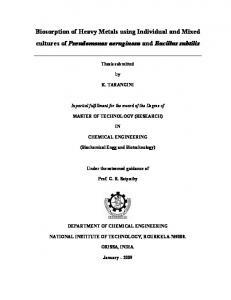 The aim of the present work was to evaluate the sorption capacity of six diﬀerent algae, Codium vermilara, Spirogyra insignis, Asparagopsis armata, Chondrus crispus, Fucus spiralis and Ascophyllum nodosum, in respect of ﬁve diﬀerent heavy metals: cadmium, nickel, zinc, copper and lead. 2. Methods Two algae from each main division (green, brown and red) were selected for the experiments. Table 1 shows the identiﬁcation of each alga (Cabioch et al., 1995; Van den Hoek et al., 1995; Graham and Wilcox, 1998). All biomass were marine except S. insignis, harvested from fresh water. The samples of C. vermilara, C. crispus, F. spiralis and A. nodosum were collected on the northern Atlantic coast of Spain and the red alga A. armata on the Mediterranean coast of Malaga, in southern Spain. Finally, S. insignis was collected at Valmayor dam (Madrid, Spain). Sample preparation consisted in a preliminary visual cleaning of impurities followed by several washes with distilled water. The overﬂow collected in each wash contained small particles of biomass substantially more diﬃcult to settle, and it was centrifuged at 5000 rpm for 10–15 min. Then, after removal of the clear liquid, the pellet was mixed with previously-washed biomass to avoid large losses of it, and the whole system dried to constant weight in an oven at 60 °C. Once dry, samples were ground to the adequate particle size for biosorption tests ( Cu P Cd > Ni > Zn. This sequence was very similar to the order of aﬃnities of the biomass for the metal (given by Langmuir constant b: Pb > Cd P Cu > Ni > Zn) and also decreased for each of the studied biomass expressed in L/mmol in Table 4. Only in those cases where values were very similar was that order of aﬃnities altered to any degree (C. crispus and A. nodosum). In addition, for the same equilibrium metal concentration, the sorption capacity of each biomass (q) also followed a similar sequence in almost all cases, in accordance with the descending order of qmax for each biosorbent (Table 4). These results corroborate the hypothesis that the binding of metal to active sites of the cell wall is closely related to some intrinsic metal property, such as ionic radii and electronegativity of atoms (Chong and Volesky, 1996; Tobin et al., 1984). On the other hand, brown algae (F. spiralis and A. nodosum) showed higher sorption capacity than any other algae (Table 4). At worst they were able to retain twice as much metal as any of the other tested algae. The presence of alginates in the cell wall of brown algae could be responsible for such behaviour by anchoring the metal to the biomass (Fourest and Volesky, 1997; Davis et al., 2000). The sequence obtained as a function of the type of alga was: brown > red > green. Of the red algae, A. armata, with an intermediate sorption capacity, behaved similarly to green algae, whereas C. crispus was closer to brown algae. This relates to the fact that the latter contains carragenates in its composition, which behave similarly to the alginates in brown algae and are responsible for metal uptake by the biomass. From this it would seem that, besides the biomass itself or the type of alga used, the sorption phenomenon fundamentally depends on the type of metal employed. Fig. 5. Values of qmax for the six algae studied and average values of fungi and bacteria. Fig. 6. Values of b for the six algae studied. equilibrium reactions between each biomass and the diﬀerent metals are probably B þ Me () B  Me where the b constant is the equilibrium constant of such model. In all cases sorption capacity was greater with lead followed by cadmium. The sorption values for nickel, copper and zinc were very similar and the general sequence was: lead > copper P cadmium > zinc > nickel. Green and red algae, without carragenates in their composition, presented similar values of qmax for all metals. In all cases, these values were much lower than those registered with C. crispus and brown algae, which besides being very high for all metals reduced the metal equilibrium concentration to very low levels. In any case, the best results were achieved with F. spiralis. All algae showed similar aﬃnities for each metal tested, but lead behaved diﬀerently in each case because the mechanism of bonding to the biomass was also diﬀerent from the other metals. The sequence of aﬃnities between each biomass and the diﬀerent metals was as follows: lead > cadmium P copper > nickel > zinc. In general, the six algae studied achieved more eﬀective biosorption of the ﬁve metals than the average values registered for bacteria and fungi. The PHREEQCI program proved to be a very useful tool for predicting the behaviour of the biomass once equilibria were deﬁned. Acknowledgements The authors wish to express their gratitude to the Spanish Ministry of Science and Technology for funding this work. Thanks are also given to Eduardo Costas from Complutense University of Madrid and Antonio Flores from University of Malaga. References ¨ ., Kutsal, T., 1997. Application of multicomponent Aksu, Z., Acikel, U adsorption isotherms to simultaneous biosorption of iron (III) and chromium (VI) on C. vulgaris. J. Chem. Tech. Biotechnol. 70, 368–378. ¨ ., Kutsal, T., 1999. Investigation of simultaneous Aksu, Z., Acikel, U biosorption of copper (II) and chromium (VI) on dried Chlorella vulgaris from binary metal mixtures: application of multicomponent adsorption isotherms. Separ. Sci. Technol. 34, 501–524. Akthar, M.N., Sastry, K.S., Mohan, P.M., 1996. Mechanism of metal ion biosorption by fungal biomass. BioMetals 9, 21–28. Cabioch, J., Floch, J.Y., Le Toquin, A., Boudouresque, C.F., Meinesz, A., Verlaque, M., 1995. Guı´a de las algas de los m ares de Europa: Atla´ntico y Mediterra´neo. Omega, Barcelona. Charlton, S.R., Macklin, C.L., Parkhurst, D.L., 1997. PHREEQCI – a graphical user interface for the geochemical computer program PHREEQC. US Geological Survey. 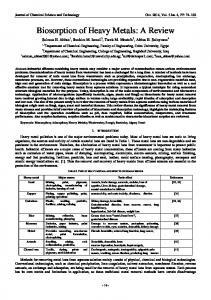 Water-Resources Investigations Report 97-4222, Lakewood, CO. Chong, K.H., Volesky, B., 1995. Description of two-metal biosorption equilibria by Langmuir-type models. Biotechnol. Bioeng. 47, 451–460. Chong, K.H., Volesky, B., 1996. Metal biosorption equilibria in a ternary system. Biotechnol. Bioeng. 49, 629–638. Davis, T.A., Volesky, B., Vieira, R.H.S.F., 2000. Sargassum seaweed as biosorbent for heavy metals. Water Res. 34, 4270–4278. Davis, T.A., Volesky, B., Mucci, A., 2003. A review of the biochemistry of heavy metal biosorption by brown algae. Water Res. 37, 4311–4330. De Rome, L., Gadd, G.M., 1987. Copper adsorption by Rhizopus arrhizus, Cladosporium resinae and Penicillium italicum. Appl. Microbiol. Biotechnol. 26, 84–90. ¨ ztu¨rk, A., Kutsal, T., 1999. A comparative study Do¨nmez, G., Aksu, Z., O on heavy metal biosorption characteristics of some algae. Process Biochem. 34, 885–892. Feng, D., Aldrich, C., 2004. Adsorption of heavy metals by biomaterials derived from the marine alga Ecklonia maxima. Hydrometallurgy 73, 1–10. 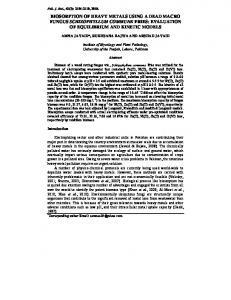 Figueira, M.M., Volesky, B., Mathieu, H.J., 1999. 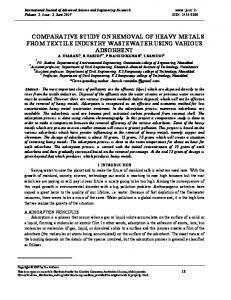 Instrumental analysis study of iron species biosorption by Sargassum biomass. Environ. Sci. Technol. 33, 1840–1846. Fourest, E., Volesky, B., 1997. 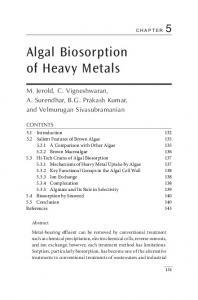 Alginate properties and heavy metal biosorption by marine algae. Appl. Biochem. Biotechnol. 67, 215–226. Gardea-Torresday, J.L., Tiemann, K.J., Gonzalez, J.H., Cano-Aguilera, I., Henning, J.A., Townsend, M.S.J., 1996. Copper adsorption by inactivated cells of Mucor rouxii: eﬀect of esteriﬁcation of carboxyl groups. J. Hazard. Mater. 49, 171–180. Graham, L.E., Wilcox, L.W., 1998. Algae. Prentice Hall, Nueva Jersey. Guibal, E., Saucedo, I., Roussy, J., Le Cloirec, P., 1994. Uptake of uranyl ions by new sorbing polymers: discussion of adsorption isotherms and pH eﬀect. React. Polym. 23, 147–156. Hammaini, A., Ballester, A., Gonza´lez, F., Bla´zquez, M.L., Mun˜oz, J.A., 1999. Activated sludge as biosorbent of heavy metals. In: Amils, R., Ballester, A. (Eds. 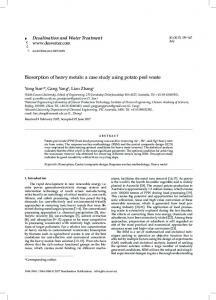 ), Biohydrometallurgy and the Environment towards the Mining of the 21st Century. 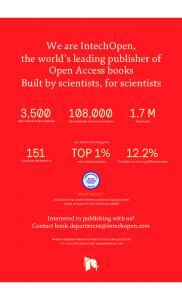 Elsevier Science B.V., Amsterdam, pp. 185–192. Hashim, M.A., Chu, K.H., 2004. Biosorption of cadmium by brown, green and red seaweeds. Chem. Eng. J. 97, 249–255. Holan, Z.R., Volesky, B., 1994. Biosorption of lead and nickel by biomass of marine algae. Biotech. Bioeng. 43, 1001–1009. Holan, Z.R., Volesky, B., Prasetyo, I., 1993. Biosorption of cadmium by biomass of marine algae. Biotech. Bioeng. 41, 819–825. Holan, Z.R., Volesky, B., Prasetyo, I., 1995. 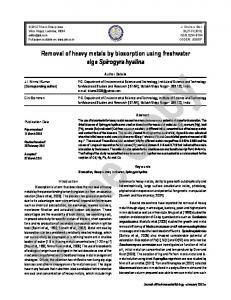 Biosorption of heavy metals. Biotechnol. Prog. 11, 235–250. Itoh, M., Yuasa, M., Kobayashi, T., 1975. Adsorption of metal ions on yeast cells at varied cell concentration. Plant Cell Physiol. 16, 1167– 1169. Kapoor, A., Viraraghavan, T., 1995. Fungal biosorption – an alternative treatment option for heavy metal bearing wastewaters: a review. Biores. Technol. 53, 359–371. Kim, Y.H., Koo, Y.J., Lee, H.Y., 1995. Characteristics of lead adsorption by Undaria pinnatiﬁda. Biotechnol. Lett. 17, 345–350. Klimmek, S., Stan, H.J., Wilke, A., Bunke, G., Buchholz, R., 2001. Comparative analysis of the biosorption of cadmium, lead, nickel and zinc by algae. Environ. Sci. Technol. 35, 4283–4288. Langmuir, I., 1918. The adsorption of gases on plane surfaces of glass, mica and platinum. J. Am. Chem. Soc. 40, 1361–1403. Lau, P.S., Lee, H.Y., Tsang, C.C.K., Tam, N.F.Y., Wong, Y.S., 1999. Eﬀect of metal interference, pH and temperature on Cu and Ni biosorption by Chlorella vulgaris and Chlorella miniata. Environ. Technol. 20, 953–961. Leusch, A., Holan, Z.R., Volesky, B., 1995. Biosorption of heavy metals (Cd, Cu, Ni, Pb, Zn) by chemically reinforced biomass of marine algae. J. Chem. Technol. Biotechnol. 62, 279–288. Matheickal, J.T., Yu, Q., 1999. Biosorption of lead (II) and copper (II) from aqueous solutions by pre-treated biomass of Australian marine algae. Bioresour. Technol. 69, 223–229. Matheickal, J.T., Yu, Q., Woodburn, G.M., 1999. Biosorption of cadmium (II) from aqueous solutions by pre-treated biomass of marine alga Durvillaea potatorum. Water Res. 33, 335–342. Mehta, S.K., Gaur, J.P., 2001. Characterization and optimization of Ni and Cu sorption from aqueous solution by Chlorella vulgaris. Ecol. Eng. 18, 1–13. E. Romera et al. 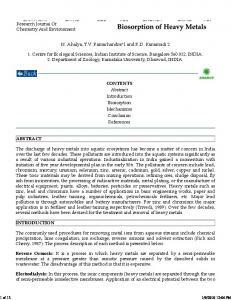 / Bioresource Technology 98 (2007) 3344–3353 Modak, J.M., Natarajan, K.A., 1995. Biosorption of metal using nonliving biomass – a review. Miner. Metall. Process. 12, 189–196. Pagnanelli, F., Esposito, A., Toro, L., Veglio`, F., 2003. Metal speciation and pH eﬀect on Pb, Cu, Zn and Cd biosorption onto Sphaerotilus natans: Langmuir-type empirical model. Water Res. 37, 627–633. Pillichshammer, M., Pu¨mpel, T., Po¨der, R., Eller, K., Klima, J., Schinner, F., 1995. Biosorption of chromium to fungi. Biometals 8, 117–121. Sandau, E., Sandau, P., Pulz, O., Zimmermann, M., 1996. Heavy metal adsorption by marine algae and algal by-products. Acta Biotechnol. 16, 103–119. Schiewer, S., Wong, M.H., 2000. Ionic strength eﬀects in biosorption of metals by marine algae. Chemosphere 41, 271–282. Seki, H., Suzuki, A., 1998. Biosorption of heavy metal ions to brown algae, Macrocystis pyrifera, Kjellmaniella crassiforia and Undaria pinnatiﬁda. 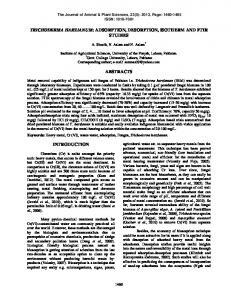 J. Colloid Interface Sci. 206, 297–301. Singh, S., Pradhan, S., Rai, L.C., 2000. Metal removal from single and multimetallic systems by diﬀerent biosorbent materials as evaluated by diﬀerential pulse anodic stripping voltammetry. Process Biochem. 36, 175–182. Tobin, J.M., Cooper, D.G., Neufeld, R.J., 1984. Uptake of metal ions by Rhizopus arrhizus biomass. Appl. Environ. Microbiol. 47, 821– 824. Van den Hoek, C., Mann, D.G., Jahns, H.M., 1995. Algae. An Introduction to Phycology. Cambridge University Press, Cambridge. Veglio´, F., Beolchini, F., 1997. 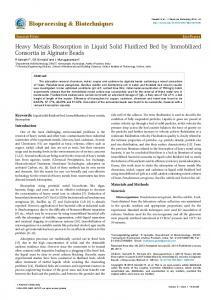 Removal of metals by biosorption: a review. Hydrometallurgy 44, 301–316. Veit, M.T., Tavares, C.R.G., Gomes-da-Costa, S.M., Guedes, T.A., 2005. Adsorption isotherms of copper(II) for two species of dead fungi biomasses. Process. Biochem. 40, 3303–3308. Yan, G., Viraraghavan, T., 2003. Heavy-metal removal from aqueous solution by fungus Mucor rouxii. Water Res. 37, 4486–4496. Yu, Q., Matheickal, J.T., Yin, P., Kaewsarn, P., 1999. 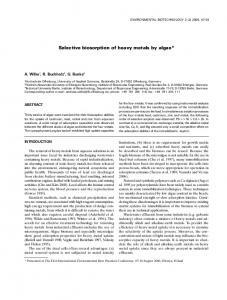 Heavy metal uptake capacities of common marine macro algal biomass. Water Res. 33, 1534–1537. 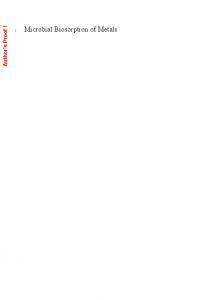 Zouboulis, A.I., Loukidou, M.X., Matis, K.A., 2004. 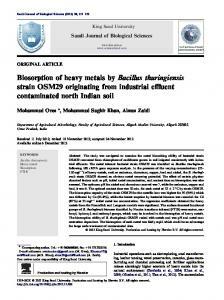 Biosorption of toxic metals from aqueous solutions by bacteria strains isolated from metalpolluted soils. Process. Biochem. 39, 909–916. 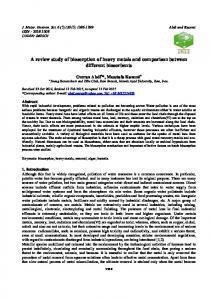 Report "Comparative study of biosorption of heavy metals ... - Semantic Scholar"